Get ready to swap your notebooks for E Ink. A very niche, very Japanese word processor is heading to US shores in the form of Pomera, a pocket-sized, E Ink typewriter. The device, made by Japanese company King Jim, is currently seeking funding on Kickstarter. It's basically a convenient new way to take notes. King Jim prefers the term 'digital memos', but you get the point. Pomera comes in a compact, foldable design, and immediately switches on when you unfold it. 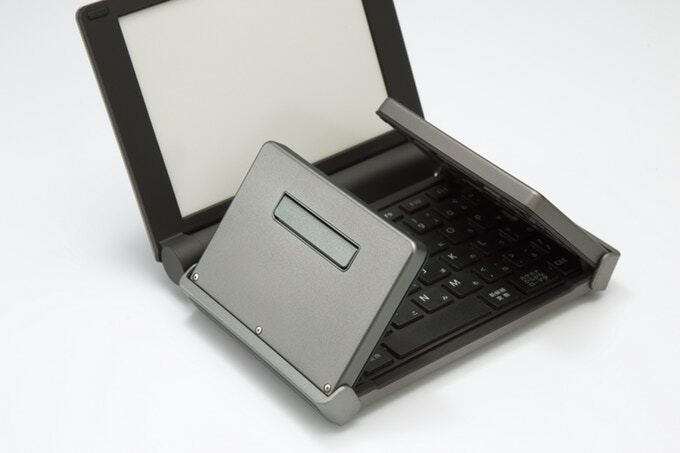 Attached to the tri-fold keyboard is a 6-inch electronic paper display which forgoes a backlight to reduce eye strain. For comfort-oriented typists, the Pomera offers generously sized keys and automatically extending feet. That sounds ideal if you need to work for several hours at a time, but what about general operation? Well, the Pomera runs on two AA alkaline (or eneloop) batteries and will last you approximately 20 hours. That's much better than the average laptop. If the Pomera was a laptop, it'd be a bantamweight -- it weighs just 450 grams minus batteries. Any text documents you create on the Pomera can be saved in its internal memory, or transferred straight to your computer via SD card or a micro-USB connection. If you're more into wireless transfers, there's a also QR code conversion option with its very own dedicated app. The Pomera DM30 -- that's the model being shipped to the US -- starts at 38,500 yen (around 350 US dollars, which is half the price of Sony's latest E Ink tablet). Shipments are expected this November.